In today's technology driven world, nothing seems to be impossible. With so much happening, what should be my ultimate gadget? Well, we all are obsessed with displays - be it our phones, laptops or TVs. While we switch between these three displays, my dream will be to have all the three combined in one, portable device. Maybe the gadget can switch roles between the three... Phablets are now available with big screen sizes of 6.4 inch, which makes them a combined device - primarily a tablet with calling facility. Continuing with the same design and form factor, it will be interesting to add high quality projection on both sides to this device. The projection in front, above the screen can be low res, but the primary lens has to be high resolution and powerful enough to project high quality content. 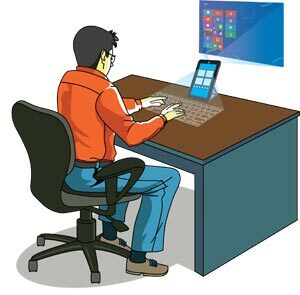 The phablet would run a smart operating system with two modes in combination with the phone mode-laptop and TV. When the laptop mode is selected, both the cameras should start projecting. The high resolution one at the back could project a 14inch bright, 4k screen while the front facing one projects a full QEWRTY keyboard along with a track pad to work on the laptop. 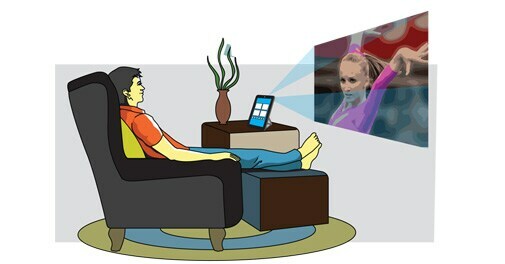 When switched to TV mode, a 55-inch screen should be projected with the keyboard replaced by a touch remote with TV controls. And to watch Live TV, I should be able to subscribe to the Live TV app service offered by various DTH operators.